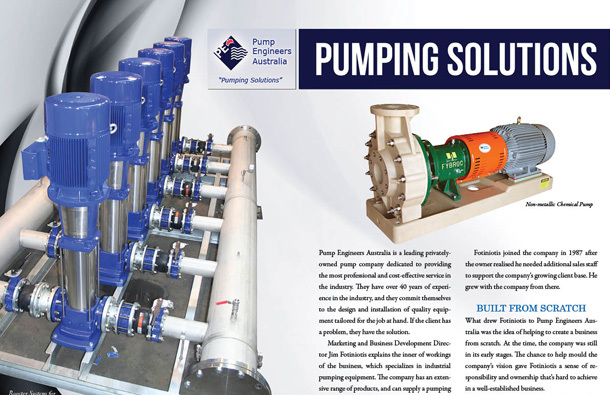 Pump Engineers Australia is a leading privately-owned pump company dedicated to providing the most professional and cost-effective service in the industry. They have over 40 years of experience in the industry, and they commit themselves to the design and installation of quality equipment tailored for the job at hand. If the client has a problem, they have the solution. Marketing and Business Development DirectorJim Fotiniotisexplains the inner of workings of the business, which specializes in industrial pumping equipment. The company has an extensive range of products, and can supply a pumping solution for any application, in industries of all types. Fotiniotisjoined the company in 1987 after the owner realised he needed additional sales staff to support the company’s growing client base. He grew with the company from there. What drew Fotiniotis to Pump Engineers Australia was the idea of helping to create a business from scratch. At the time, the company was still in its early stages. The chance to help mould the company’s vision gave Fotiniotis a sense of responsibility and ownership that’s hard to achieve in a well-established business. Another factor that drew Fotiniotis to the organisation was the open communication that was fosteredbetween staff and management. The company has an open-door policy and encourages all of their 23 employees to approach upper management with any concerns or ideas, regardless of what they may be. The same is expected of upper management, who feel comfortable enough to discuss issues with staff. The employees who have been with Pump Engineers for a number of years are encouraged to keep an open mind when it comes to learning new things. “Knowledge is vital to success,” Fotiniotis says. A continued commitment to constant training provides the company’s sales and service personnel with up-to-date knowledge of the latest developments in pump technology. This adds up to totally dedicated service, from initial sales advice, to design, and final configuration and delivery. Pump Engineers’ clients are just as valued as their staff. With such a broad customer base, Pump Engineers deals with clients from all industries including food and beverage, chemical processes, mining and many facets of the manufacturing industry. This gives the company a clear advantage over their competitors, Fotiniotis says. If certain industries are slowing down, the company can shift its focus to the industries that are picking up. This allows the business to stay competitive even in difficult economic times. What keeps their customer base large and loyal, Fotiniotis says, is Pump Engineers’ excellent reputation that has been carefully constructed over the last 30 years. The company is focused on helping their customers find the right pump, regardless of brand – unlikea manufacturer who is tied to selling their own product. Pump Engineers has access to a number of different products, which aids their customer in finding the best solution available. A quick response to customer needs is also considered fundamental, as well as constant communication and customized solutions.This approach has furthered Pump Engineers’ name amongst its competitors and customers alike. When discussing the future direction of the company, Fotiniotis emphasises the importance of growth. “You can never stop growing,” Fotiniotis says, adding that he wants to see more expansion in the Sydney and Brisbane markets, where they have offices. The growth potential in those branches is great, as they haven’t been established as long as the Melbourne office. More business in these markets will also mean more employment, which is a great way to help support the local community, Fotiniotis adds. The company aims to have all three branches of the company fully-functioning, so they can work independently from the head office to promote more efficient time management, and thus boost customer satisfaction. With such a broad network, Pump Engineers is perfectly situated to service businesses throughout Australia, both quickly and resourcefully. This has led to the company becoming one of the most reputable and well-known pump supply companies in Australia. 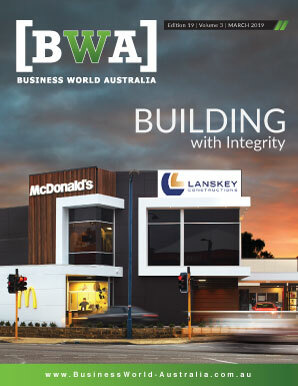 With such a strong customer base and a loyal workforce, their vision of continuous growth is already well underway.